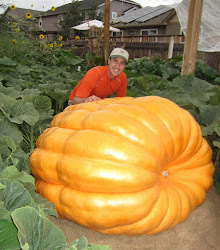 The following is my "secret"giant pumpkin fertilizing program. This fertilizer program will be modified during the season, depending on what the plant is telling me. In addition to what is listed below, I'll also be putting down a little Azos, myko, kelp and Rootshield to each leaf node. What is listed below doesn't include what I amended the soil with in the Fall and Spring. The Fish & Seaweed is Neptune's, foliar multimineral is Albions' Metosolate multimineral and most of the other products are NPK Industries' RAW fertilizers. Please note that the quantities of different fertilizers being applied here are very small. You want to spoon feed the plant to push it along and don't want to pour on the fertilizers which can sometimes do more harm than good. Fertilizers should be applied in the early morning or the evening. Most of these fertilizers, bio-stimulants and nutrients are available at a discount at http://seeds.giantpumpkinman.com/fertilizers. Week 1 B-vitamin, liquid seaweed/kelp, compost tea. With mykos, myco grow, Rootshield and Azos in the planting hole.